Download the 198-page Medium White Book (as opposed to a Little White Book that accompanies a deck) for free. Yep. This is a free tarot book download. Bear in mind there are two versions, one keyed to the First Edition black and white deck and one keyed to the Vitruvian Edition sepia-toned deck. Make sure you’re downloading the one you want. 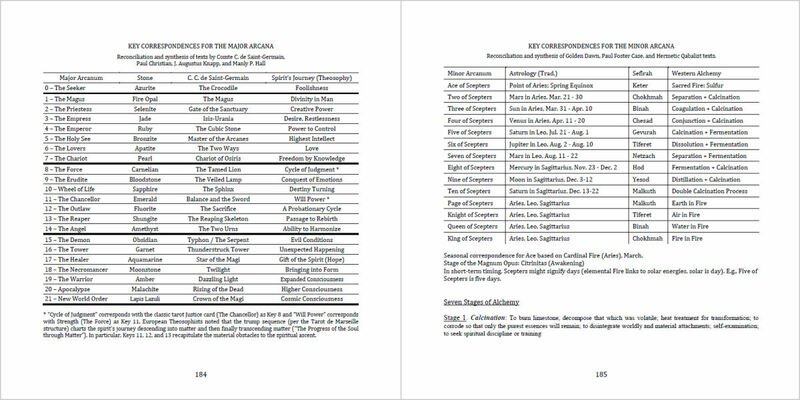 Anyone can download the PDF files for this text to help them ascertain the accessibility of the Spirit Keeper’s Tarot deck before ordering or, after you have the deck, to help you acclimate with the cards and become more familiarized with its operations. 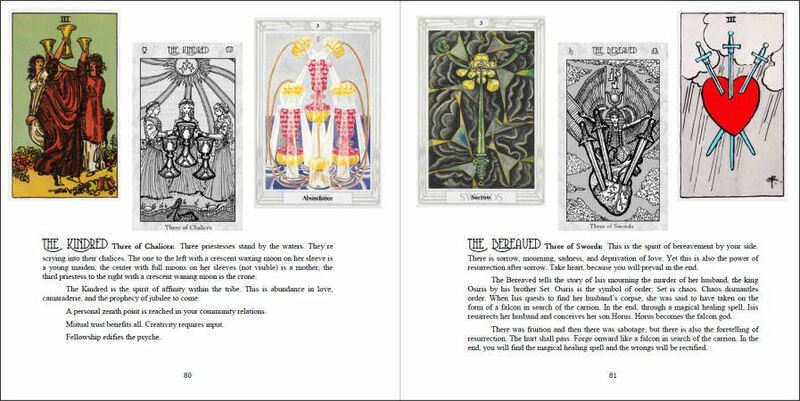 Although the primary purpose of the text is to be an introductory-level guidebook to the Spirit Keeper’s Tarot deck, there’s a lot of content in here for enriching your work with the tarot in general. There are several reading techniques and tarot spreads, for instance, and some beginner-level tips on shuffling, initial reading tips, how to read the tarot intuitively, tarot for psychic development, and reading with reversals. Then there’s a whole section in the back with reference and correspondence tables you might find useful. Those tables help you to see the connections between tarot and the elements, tarot and astrology, tarot and alchemy, tarot and the Tree of Life, tarot and numerology, etc. 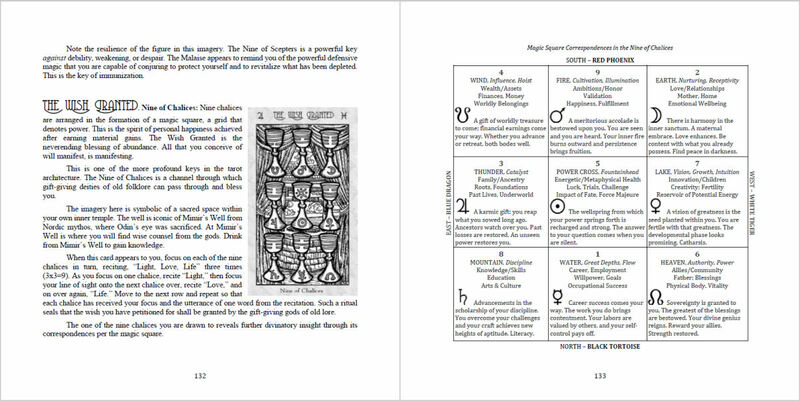 If you try out the Strategic Plan reading spread, on p. 152 there’s a checklist and guide on how to integrate elemental, numerological, astrological, Kabalistic, and alchemical connections into your divination, guided by those reference tables. For those who have never worked astrology into their tarot readings, Kabbalistic correspondences and aren’t even sure where to begin, how exactly to account for numerology in a tarot reading, etc., then following the guidelines for the Strategic Planning Spread is a great place to start. It’s going to be accessible and practical for any beginner or novice. And remember you can click on any heading in the table of contents and the PDF file will take you straight to that chapter of the book, so you don’t have to keep on scrolling to get to any one section. 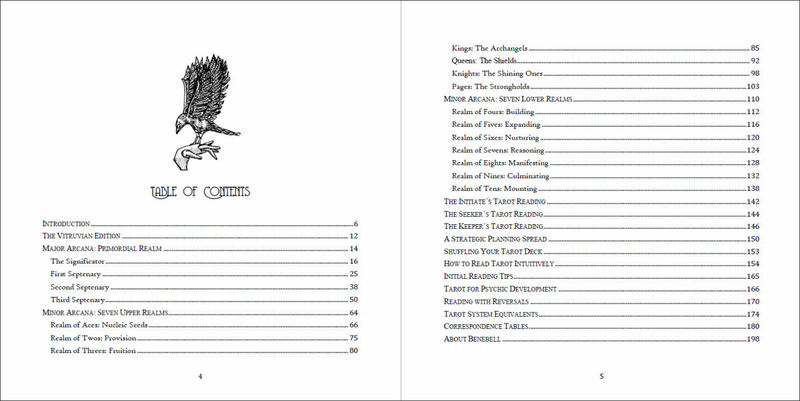 You can navigate directly from the hyperlinked table of contents in the e-book. Two versions of the Medium White Book are provided on this page. 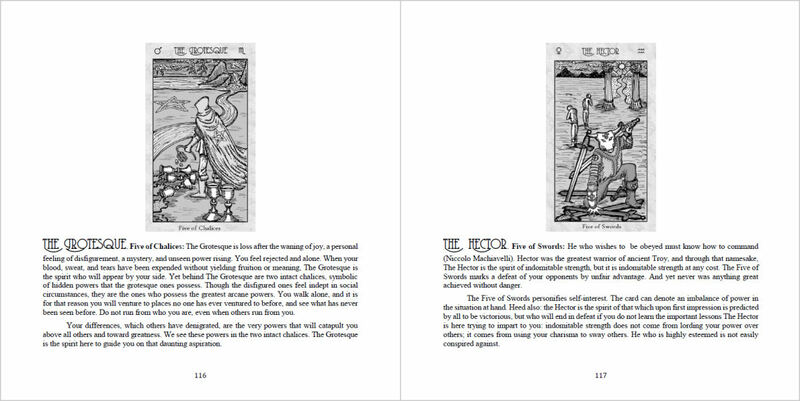 Although the content is the same in both versions (except for one of the beginning chapters and minor changes to the entries for the redesigned cards), one is keyed to the 2018 First Edition and the second is keyed to the 2019 Vitruvian Edition. 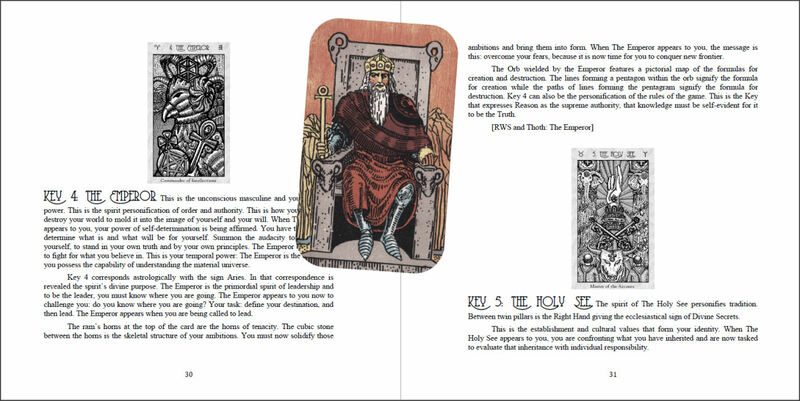 I’ll address the MWB for the Vitruvian Edition first and for those with the First Edition deck, scroll all the way down for the downloads and access links to the First Edition MWB. 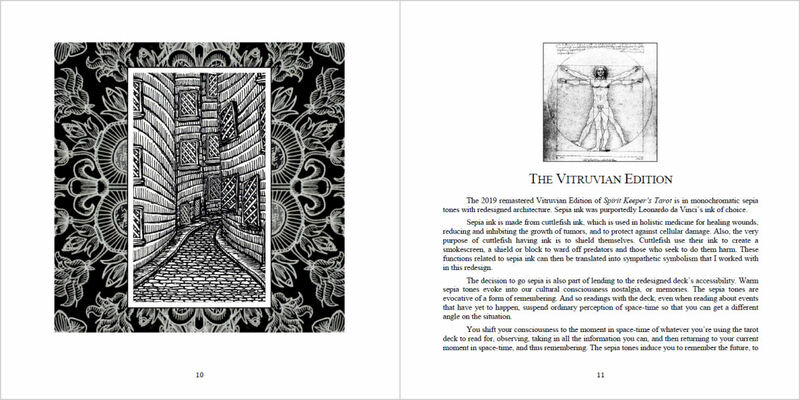 You can also check out a side by side comparison of the First Edition cards with the Vitruvian Edition. Go to Gallery of All Cards. 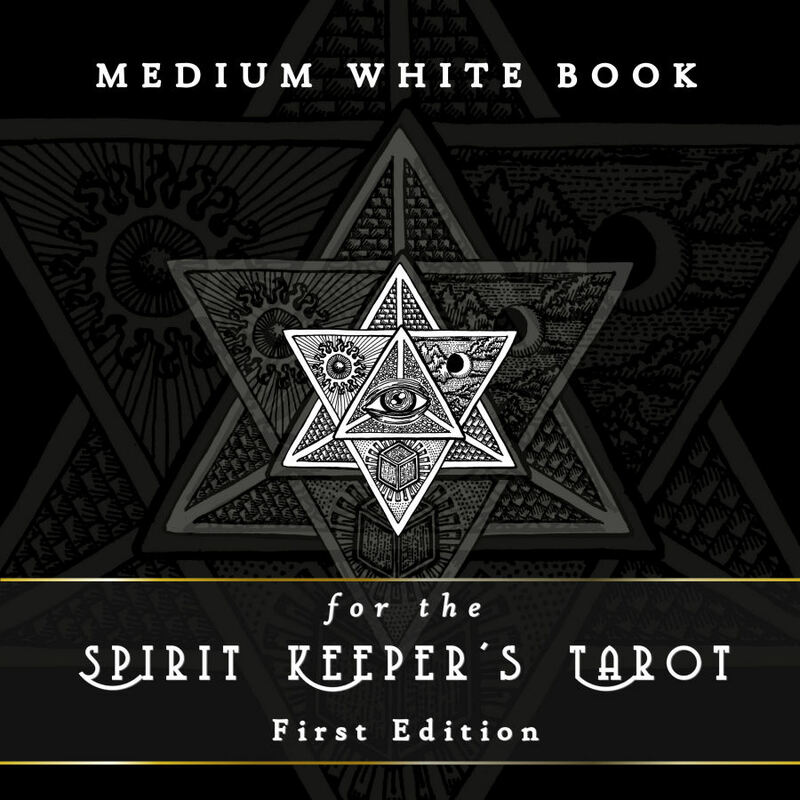 The Medium White Book is an introductory-level guidebook to the Spirit Keeper’s Tarot deck, Vitruvian edition. You can download the E-book as a PDF file. It’s totally free. Scroll down for the link to save your own copy of the Book. You can also order a print copy for $9.24. All details and purchase link below. 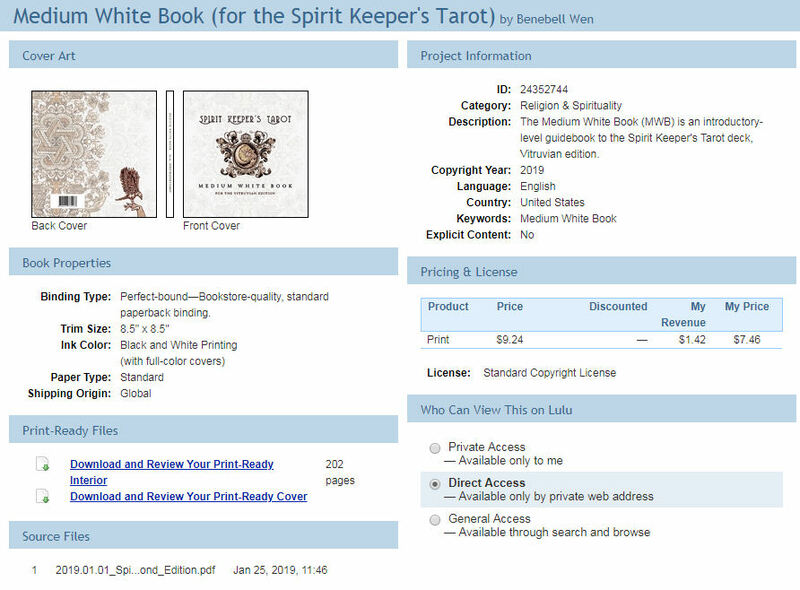 There are three books (maybe we should say two and a half… I don’t think the LWB counts as a book) that come in three different sizes for understanding the Spirit Keeper’s Tarot. The Little White Book (LWB), pictured above left, is 2.75″ x 4.75″ and comes tucked inside the box with your deck. Due to the space constraints, it doesn’t contain much. To help you compare what’s contained in the LWB compared to the MWB, the LWB is approximately 20,000 words in word count while the MWB is 50,000 words. Anyway, back to that LWB. After completing the LWB for the Vitruvian Edition and seeing how the teensy little booklet actually looks in print from the First, I decided I’d do those of us with bad eyesight a solid and format the contents of the LWB into a larger size book, in larger size font. The digital files for the larger LWB would be included with every purchase of the deck. As I worked on that larger size version of the LWB, to get the layout looking more proportional, I found myself adding more text to the LWB just so the paragraphs of text plus images would fit better on the page. I took bits and pieces from the Book of Maps and also just added more practical insights into each of the cards, writing new content as I formatted. Soon enough, the larger size LWB was no longer a faithful magnification of the LWB. It was its own new text (sort of). So I decided to call this new product the Medium White Book. =) Above was the original cover design I wanted to go with, but then after uploading and formatting on Lulu.com (the third party print-on-demand service), you’ll see where Lulu automatically sets the barcode. So I had to change up the design to the below. The e-book version of the Medium White Book (MWB) is best for online viewing only, or to store it on your smartphone or tablet for digital access. 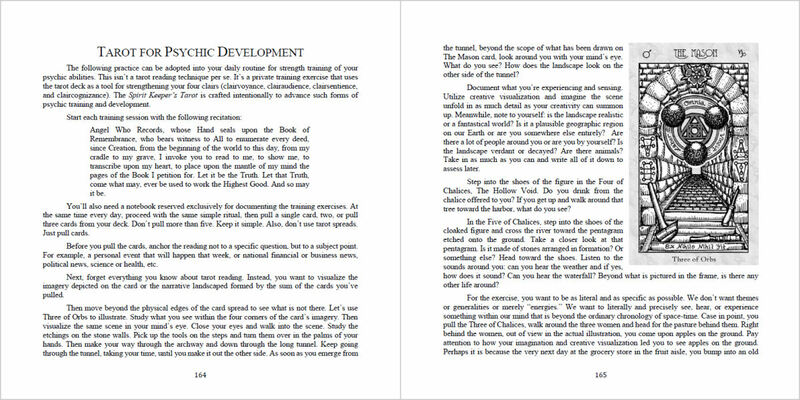 The recto and verso page spread alignment in the PDF version is also not formatted in a way that’s optimal for physical printing, whereas the physical copy of the book uploaded to Lulu considers the recto and verso page spreads. Click on above link for PDF in DropBox. Please note that there are no mirror margins or gutter set for the e-book. Thus, it’s not ideal for home printing and binding because there is insufficient gutter margin to bind. If you want a readable printed physical copy, order one from Lulu. It’s under $10 and thus budget-friendly. Since you’re bothering with printing the pages out anyway and running through all that paper and ink, honestly it’s probably going to be more economical and practical for you to just buy the paperback book from Lulu. $9.24, people. I’ve also uploaded it to Lulu so you can order a printed and bound copy at 8.5″ x 8.5″ if you’d prefer to have a physical, professionally bound book in hand and you’re willing to pay for it. 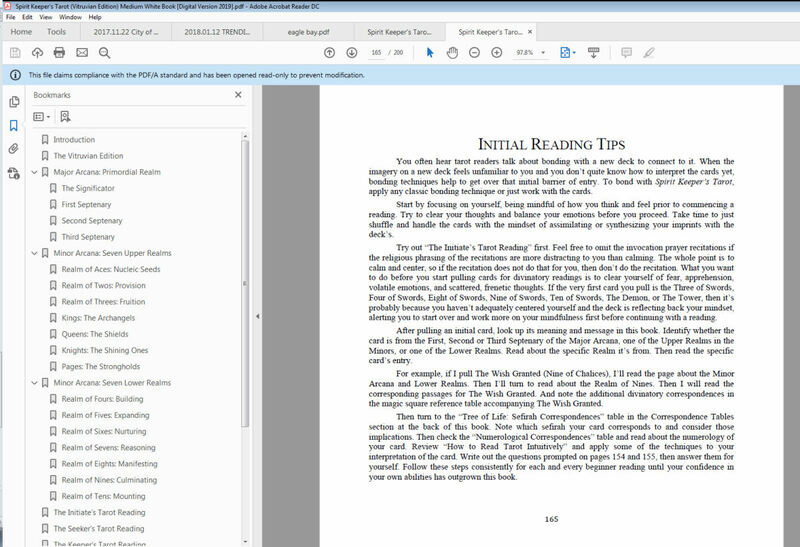 Once you open the PDF file in Adobe Acrobat Reader, click on the bookmark icon in the left-most vertical margin. You’ll see it pictured in the above screenshot illuminated blue. Then a navigation pane will open up with the table of contents. You can click on any heading to go straight to that section of the book. Click on above link for the Lulu order page. The printed physical copy costs you $9.24 to purchase because you’re paying that to Lulu, not to me. My revenue is exactly $1.42. So please don’t think I’m breaking the bank with these printed MWBs. I’ll even share with you the screenshot from Lulu. See below. The $7.46 under “My Price” is not set by me. That’s fixed by Lulu for the cost of printing. Actual cost of printing is $7.46. “My Revenue” of $1.42 is what I earn per order. You pay $9.24. When you order the deck, even the deck only and not the premium package, you’ll get the printed black and white LWB inside the deck box with the cards. The LWB is probably still useless, but at least you get a little bit to go on in terms of individual card meanings. The tiny little booklet is just to make sure everyone who gets the deck has at least something to go off of. The Book of Maps, at 700+ pages and ambitious in its scope, vision, and objectives, isn’t for everyone. The Book of Maps presumes you want to read about Olympic spirits and the SKT deck, evocations and invocations, discussions on angelology, magic squares, integrating tarot and the I Ching, tarot and astrology, tarot and gematria, and ritual magic with the SKT. Which, honestly, I thought was like, everybody, but apparently not. Even the practical-oriented chapters presume baseline proficiency with the tarot, like prior knowledge of the Opening of the Key operations or that you’re at a level of reading tarot where you read for others. So the MWB is the Middle Path. =) It’s everything contained in the LWB, plus a little sampling taste of what’s in the Book of Maps, plus new content unique to the MWB intended for a more general audience. 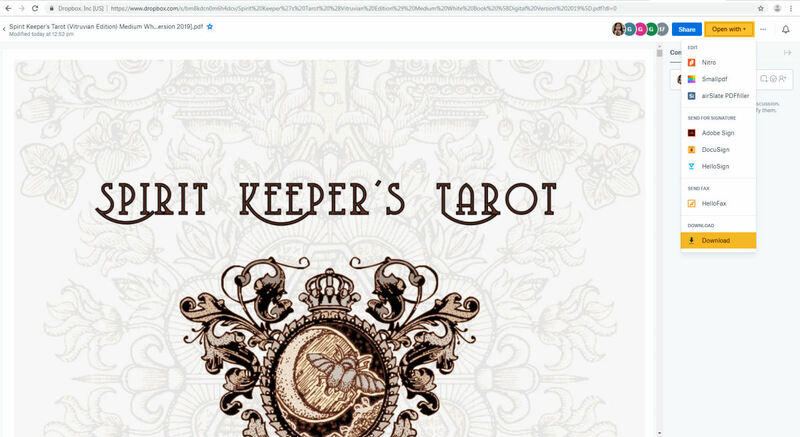 Spirit Keeper’s Tarot is an esoteric tarot deck (genre wise) and my operations with the deck or how I talk about the deck’s functionality is going to be entrenched in that world. However, that is not to say the Spirit Keeper’s Tarot is only for such functions. Before it’s anything else, it’s just a tarot deck. In all the ways you would or could use a tarot deck, SKT works for that, too. Yet every deck reads a little differently from other decks, influenced by the art style, what’s depicted on the cards, and of course the deck creator’s point of view. The tone, phrasing, and personality of each deck is going to be unique, and in some way an extension of the deck creator. So of course Spirit Keeper’s Tarot will exhibit a distinct tone, way of phrasing, and personality. The question you have is whether that tone, way of phrasing, and deck’s personality is going to work for you. Read the free MWB so that you can answer that question confidently. The MWB is the case I’m making, appealing to you, with the assertion that this deck is functional and you will be able to read well with it. Instead of making you trust me on my word, I’m showing you so you can judge for yourself. Yes, definitely parts of the MWB skates into the woo, but it’s also offered in such a way that the woo can be ignored. Yes, you can cherry-pick. Yes, of course that’s fine. Just interpret everything woo as metaphors. When I retell certain myths in reference to some of the cards, I’m saying there’s a relevant insight to be gained from understanding the implications of the myth. What is the energy of the Spirit Keeper’s Tarot deck like? The MWB is going to carry the same energetic imprint as the SKT deck, so if you’re wondering what the vibes of the SKT deck might be like in your hands and whether there can be a compatibility there, check out the MWB. Your intuitive impressions of the MWB will help you gauge rather accurately how you’ll connect with the deck itself. See, as much as I want you to buy this deck, I also don’t want you to waste your money. It’s important that I manage your expectations. I’m a picky deck buyer and deck collector myself. I know what information I want availed to me before deciding whether to invest in a deck. So that’s what I’m providing to you– what I would want to see personally so I can make the most educated investment decision. Given that the Spirit Keeper’s Tarot was born from fathomless waters of the occult, can you still read the deck and gain deep insights from it even without a single drop of knowledge or interest in the esoteric? If you’re a total tarot beginner and reading The Book of Maps is way out of your league for now, can the SKT deck still be functional in your hands? I wrote the MWB exactly with a tarot beginner in mind or, at the very least, a practical and rational-based tarot enthusiast who wants to get a better handle over the basic SKT architecture. Let’s say the few glimpses of the deck art you’ve seen gives you apprehension because you’re wondering if the crazy amount of detail is going to be too overwhelming. Will you be able to interpret the cards? This is exactly why I’m providing the E-book version of the MWB free for download. Work with the MWB. Look through it. Check out the card images while reading their corresponding entries. Read some of the chapters about the deck or working with the deck and conclude for yourself, in an informed manner, whether the deck’s detailed imagery is going to work for you. I believe it will. I believe those who are apprehensive about the deck from the cursory glances at the art they’ve seen are simply feeling uncertainty around something they’re not yet familiar with. Once you feel a little more familiarity with the deck and its artwork, you can arrive at a more educated decision about whether or not to buy the deck. Can you read the deck intuitively? I say yes, and I include chapters in the back of the MWB to explain how SKT can be read intuitively. There’s also a chapter on how to use the SKT deck for psychic development or training. You can use the SKT as an exercise tool to improve, strengthen, and increase the frequency of your intuitive hits. Or maybe you do want to learn a little more about esoteric tarot (as a genre of tarot decks) but have never done so before and don’t quite know where to start. What should you do? The MWB was also written with that in mind. It offers an introduction into some of the alchemical references in the deck’s symbology, Hermetic iconography, and explains the mystical implications of the more prominent symbols on each card. The Book of Maps will delve far deeper into each symbolic reference and detail, but the MWB should offer a good cursory overview. I also encourage you to follow one of the tarot reading procedures or tarot spreads instructed in the book using your copy of the Rider-Waite-Smith or Thoth. Yep, use the RWS or Thoth but working with the MWB. Try it out for yourself. 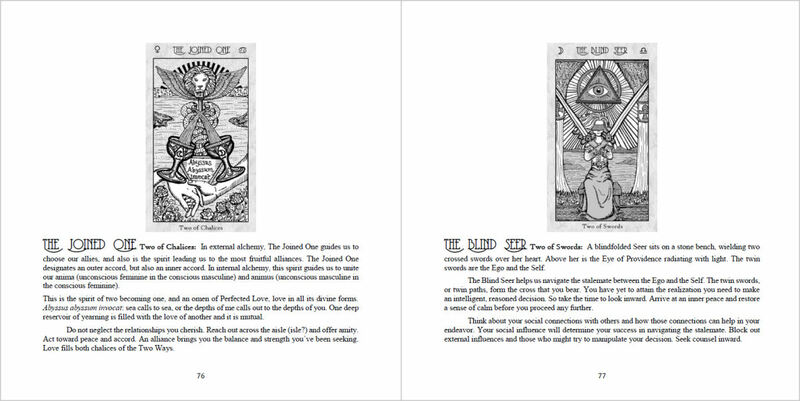 Pull a card from your copy of the Rider-Waite-Smith tarot deck, and then look up the corresponding entry in the MWB. Integrate the messages I give about the SKT version of that card with your own RWS card reading. In the magical theory I’m subscribing to, this works because the SKT deck was born out of two parents: the Rider-Waite-Smith designed by Waite and the Thoth designed by Crowley. You’re using either of the parent decks to get a better sense of the resulting child deck. Try out a couple of readings or card draws with either your Rider-Waite-Smith or your Thoth deck and then integrate the messages about the resulting cards from my MWB. Get an operational sense for how these approaches feel to you. If something clicks, then I think you’re really going to dig the SKT deck. Order Period Ends March 20, 2019. Delivery Expected July 31, 2019. For those who have the First Edition deck and would like to use a Medium White Book keyed to the card images from the First Edition, click on the download link above. The digital files for the First Edition MWB includes mirror margins and a gutter set for binding. Unlike the PDF e-book file for the Vitruvian Edition, this First Edition e-book file is formatted so you can print and bind by yourself from a home or office printer. Just make sure to print double-sided. Do not print single-sided or else you won’t be able to bind the book. After printing double-sided, you can manually cut the pages down to the 8.5″ x 8.5″ dimension, hole punch, and bind yourself. Or just purchase a print copy from Lulu. The printed physical copy costs $8.59 to purchase. If you have both the First Edition and Vitruvian Edition, I recommend printing the Vitruvian Edition and then writing in your own notes on the relevant page entries with added information specific to the First Edition. That will save you from having to print out both books.